A well-known Sun temple of India.Built by the Solanki ruler Bhima Dev in 1026 AD. Once a magnificent temple, dedicated to Lord Surya, now in ruins. However, enough is still there to covey its grandeur. At present there is no worship offered at the temple. Legend says the place is holy as Lord Sri Ram came here for pilgrimage. The Lord Sriram asked the Sage Vasishta to suggest a place where he can go for pilgrimage to alleviate the sin of killing Ravana-a Brahmin by birth. 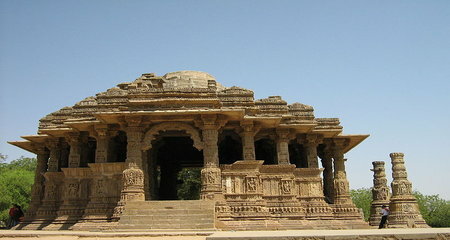 The sage directed him to Dharmaranya-the present day Modhera. The temple comprises three main structures. First is Guda Mandap, i.e. sanctum sanctorum which once housed the idol of Sun God. It is designed in such a way that the first rays of the Sun fell on the image of Surya, the Sun God, at the time of equinoxes (the days when the length of day and night equals). Second is the Sabhamandap. The open hall with ornately carved pillars and ceiling; it faces the Guda Mandap. The Guda Mandap is basically a place for gathering. The hall between the Guda mandap and the Sabha Mandap has 12 niches, showing the different aspects of the Sun in each month. The third one is the Surya Kund- the massive temple tank. It is an architectural wonder by itself. The temple is an important tourist attraction. The Modhera dance festival in January attracts many visitors. Modhera is 108 kilometers from Ahmedabad � nearest major city and the state capital.